EPM, Alstom, Ferrovial Agroman Chile, Sainc Ingenieros Constructores, Carmago Correa, Constructora Conconcreto, Coninsa Ramon H.
Ituango hydroelectric project is being developed in the Ituango region of Colombia. Image courtesy of Sergio Fajardo Valderrama. Construction work in progress. Image courtesy of EPM. The first home being delivered to one of the displaced families. Image courtesy of EPM. The 2,400MW Ituango hydroelectric project will be the largest hydropower plant in Colombia. The plant is being built on the banks of Cauca River, eight kilometres downstream of the Pescadero road bridge. The project is located in the northwestern region of Antioquia, about 170km north of the Colombian city of Medellin. The project is a part of the initiative undertaken to exploit the hydroelectric potential of the Cauca River in its middle stretch. Ituango was identified as an ideal site for the same. The project is being developed by Colombian multi-utility group EPM (Empresas Publicas de Medellin). The first stage of commercial operation of the plant is expected to begin in 2018 and the second stage in 2022. Upon its completion, the project is expected to generate 13,900GWh each year, accounting for about 13% of Colombia’s total installed power capacity. The total investment on the mega project is estimated to be $5.51bn. It is expected to generate around 6,000 direct jobs and 24,000 indirect jobs. "The project is a part of the initiative undertaken to exploit the hydroelectric potential of the Cauca River in its middle stretch." Although the feasibility study of the project was done way back in 1983, the project was put on hold for more than two decades, especially because of the economic crisis during the 1990s. The designs for the project were finalised in 2008. EPM and the Antioquia government came forward to form a joint venture company called Hidroituango for building the project. An agreement was signed on 25 August 2010 between IDEA (Institute for the Development of Antioquia) and EPM, according to which the latter will be responsible for financing, building and operating the 2,400MW hydroelectric plant for 50 years. Eventually, a special purpose vehicle (SPV) called EPM Ituango was created by Hidroituango in March 2011 to manage the development of the project. The project management contract was finally awarded on 8 July 2011. EPM holds a stake of 97.13% in the SPV. The preliminary construction work on the project, such as river diversion and access road construction, has been underway since September 2011. Two parallel tunnels, both one kilometre long and 14m in diameter are being excavated to divert water from the Cauca River. The project also includes a one kilonetre-long access tunnel and a 140m-long powerhouse gallery. Construction on the same is expected to be completed by the end of 2013. The process of contracting out principal works in the project, namely the civil engineering works and the importation and installation of electromechanical equipment, was also launched in 2012. The project comprises of a 79km long reservoir with a flood area of 3,800ha and an active capacity of 980 million cubic metres, and a 225m high earth-core rock-filled embankment dam with a volume of 20 million cubic metres. "The project is being developed by Colombian multi-utility group EPM (Empresas Publicas de Medellin)." The dam will have a controlled spillway with a design flow of 22,600 cubic metres a second. The powerhouse will be underground with eight 300MW generating units, each driven by a headrace tunnel equipped with Francis turbines and vertical shaft synchronous generators. Water will be fed to the turbine chambers through eight tunnels. There will be two separate tunnels as well, for returning the water to the Cauca River. The hydraulic head of the power plant will be 197m. A 500kV main substation will be built outside the dam to transmit the power generated from the underground powerhouse. The total project cost is estimated to be $5.51bn. EPM has planned to invite investors for the project and had also requested for the government to declare the project site as a duty-free zone. As per this plan EPM seeks to retain a 56% stake in the project and offer the rest to other investors. In case it fails to attract investors, the company will go ahead with developing the project on its own, with 60% debt and 40% equity. A consortium of Ferrovial Agroman Chile (60%) and Sainc Ingenieros Constructores of Colombia (40%) received a contract worth $77.3m in July 2011 to build a powerhouse access tunnel and two river diversion tunnels for the Ituango hydropower project. 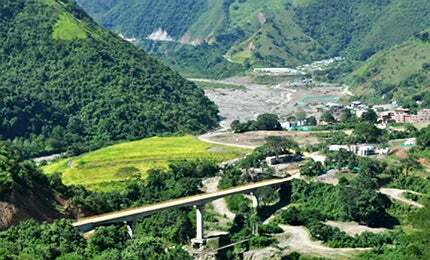 The consortium of CCC Ituango, which is comprised of Brazil’s Carmago Correa (55%), Colombian firms Constructora Conconcreto (35%) and Coninsa Ramon H (ten percent), was awarded a $66.3m contract for major engineering civil works of the project, in August 2012. Alstom Brasil Energia eTransporte, a subsidiary of French heavy engineering group Alstom, was awarded a $225.6m contract to supply the principal electromechanical equipment, such as turbines, generators and associated equipments for the project. Unión Temporal Conintegral-UDEM was awarded the environmental quality monitoring contract for the project in May 2012. The project has faced resistance from local interest groups (small scale miners and cocoa farmers) as well as environmental / bio-diversity activists. Revolutionary Armed Forces of Colombia (FARC), a Marxist-Leninist revolutionary guerrilla organisation, is alleged to have mobilised around 7,000 displaced people in protest against the project construction. The developer of the project is, meanwhile, earnestly engaged in developing an Environmental Management Plan for possible prevention, mitigation, monitoring or compensation, in the areas of human and ecological interest affected by the project. The project’s Environmental Impact Study states that a total of 182 families will be subject to relocation. The developer affirms that the rehabilitation process is already in progress. The Guri hydroelectric power plant is situated 100km upstream of the Caroni River in Necuima Canyon in Orinoco, Venezuela. All twelve turbine-generators have entered commercial service at the Caruachi hydroelectric plant, Venezuela. The hydro plant, on the river Iguaçu in Brazil, provides more than 6,500MW of capacity with average annual output of 5,431GWh.